In Japanese terminology 'Kan' is dojo and 'Ren Sei' simply means 'training or drilling', here we are referring to the mind and body. In 2011, It became apparent that an Aikido presence would be beneficial in Kidderminster and the surrounding areas, Suitable premises for a "Dojo" were researched and premises were found at the new Samurai Dojo, which was still at building foundation stage in Zortech Avenue. After a meeting with the principal of 'Samurai' Mr Andrew Haffner, the original Wednesday night class was secured and so Kidderminster Aikido Club was born, we opened after the completion of the building in September 2012. This was followed soon afterwards with the Saturday and Sunday classes. GSK Association is compliant with the regulations of the Aikikai Foundation, Aikido World Headquarters, Tokyo, Japan. We value our relationship with Aikido World Headquarters (Hombu Dojo) and the Aikikai Foundation, and strive to support them as best as possible, through training and other activities. To which our "Dan Grade" certificates are issued by the Hombu in Japan. Recently Go Shin Kai ran an Alliance course with other Aikido Houses, including Shun Poo Kan and Te Shin Kai. "Failure is the key to success; each mistake teaches us something". Ren Sei Kan Aikido – We are classed as a traditional weapons orientated style based on Chiba sensei's Martial approach. As a club we are always looking for ways to develop rather than just repeat a process, without fully understanding its origins and reasons. Our dojo follows the teaching and frame work of Chiba sensei and has a very great interest in the practice and study of the Martial Attitude and how Aikido comes from thousands of years of learned experience from the Samurai sword, all of which relating to Ueshiba's Aikido. The main emphasis being the continued development and growth in Aikido in the UK, so that the art is not lost. Aikido derives mainly from the martial art of Daito-ryu Aiki-jujutsu, but began to diverge from it in the late 1920s, partly due to Ueshiba's involvement with the Omoto-Kyo religion. Many of Ueshiba's senior students have different approaches to aikido, depending on when they studied with him. Today Aikido is found all over the world in a number of various styles, with broad ranges of interpretation and emphasis. However, they all share techniques learned from Ueshiba the founder of Aikido. Our grading are based on time spent learning, the grades are a test to see whether the student has been able to recognise the instructions given, and how well they have performed the techniques, each step up the ladder requires greater knowledge and ability. It may take decades to master due to the complexities and scientific precision required, even the masters say that they are still learning and have not reached perfection. Why does it take so long to master? watching and doing are two separate things, self awareness of ones owns actions are also hard to recognise. To become an expert in any one thing takes 10,000 hours of dedicated training and in Aikido there are many areas in which to become an expert in. All of our grades and ranks are in accordance with the Aikido World Headquarters (Hombu Dojo) and the Aikikai Foundation in Tokyo, Japan. We value our relationship with Aikido World Headquarters (Hombu Dojo) and the Aikikai Foundation, and strive to support them as best as possible, through training and other activities. "Everyone has a spirit that can be refined, a body that can be trained in some manner, a suitable path to follow. You are here to realise your inner divinity and manifest your innate enlightenment". There are many reasons to choose Aikido as a martial arts. However it is something that you must experience and try for yourself to decide, not everyone is suited. Aikido is a discipline as well as a martial science that required dedication and an open mind. Aikido is just as effective as any other martial arts if not more so, especially in today's society of knife crime. I personally have a Boxing, Fung Fu, BJJ and MMA martial arts back ground and consider Aikido at the top of the food chain regarding effectiveness and lethality, you will find those that oppose this view, however I counter this by suggesting; if you put an MMA fighter with an Aikido & BJJ background, he will be more devastating than his opponent who has no martial arts focus. One must be an expert in all fields. Additionally Aikido is the heart of any Samurai, it keeps you extremely fit, installs confidence, clarity of mind, and the ability to protect yourself regardless of age, size, gender or ability furthermore you become a part of a global family with friends all over the world. For the first two weeks (free introduction rate) you should dress comfortably in relaxed gym wear, preferably long sweat pants and a T-shirt or sweat top, not to warm. you don't have to invest in a uniform (Gi) until your confident enough, which we can provide (even second hand Gi's if required) through Ninecircles shop. Bring flip flops or crocks for your feet. most importantly please trim your nails as not to scratch others (Hygiene is also very important). The first two week are free for those wishing to try out Aikido for the first time. (Please see other deals that may be on offer). classes cost around £2.50 - £5.00 (2 hours) depending on age and membership status, monthly and annual subscriptions are available. Go Shin Kai Association has been created through the amalgamation of five founding Clubs. These clubs range in size and geographical location throughout the United Kingdom. Go Shin Kai Association stands roughly at 120 members strong and growing! We are members of The British Aikido Board (BAB) who are recognised by Sport England , as the only governing body for Aikido in the United Kingdom which is also a member of the Sport and Recreation Alliance. Presently, Go Shin Kai Association covers the Mercia area; North/Central Birmingham, Kidderminster & Wyre Forest, Gloucester, as well as London and Huddersfield. "When an opponent comes forward, move in and greet him; if he wants to pull back, send him on his way". How do I make contact with the club or an instructor? You can use the form provided on this website. We also have a Facebook page, later we shall add you to our emailing list and you can make direct contact with individuals. If you decide to go directly to a class, please arrive well before the class starts, so that the teacher has a chance to talk to you. I am not very fit - can I still practise Aikido. Please talk to your teacher and work within your limits. It is your responsibility to make the teacher aware of any health conditions, injuries or illness that you may have (Especially High Blood Pressure or Heart Problems), please contact your local GP should you have any concerns before hand. As a general rule Aikido is an art that can be practiced by ANY age or capability. Aikido emphasises correct technique over muscular force. As above please consult your doctor first to make sure, the art can be practiced by almost anyone, but a Doctors letter stating that you are fit to practice will be required. I want to start Aikido - when should I arrive for my first class? You will need to complete membership registration and go through a few formalities. You should arrive well before the class starts to ensure that your ready. Now that I am a member, when should I arrive for the class? The majority of clubs require the students to arrive early to lay out the mats. (Ren Sei Kan Dojo has a permanent matted area). Arrive in plenty of time to get changed so that you can step onto the mat feeling calm and not rushed. It is also wise to warm up and practise basic principles. If it is your first class please wait and watch until you have spoken to the teacher. If you have already joined the Club, and arrived late, just get changed quietly and wait by the side of the mat until the teacher calls you on. No don’t worry. The nature of aikido is to work in harmony with your partners. Higher grades are expected to treat lower grades with respect (and vice versa). You will be made to feel welcome and will benefit from practice with the higher grades. It is best to train with a higher grade so that mistakes are avoided. First ask the teacher in charge for permission to leave the mat. When you return, wait by the mat until you are asked to come on. It is helpful and shows respect when students help to tidy the dojo by putting mats away or generally tiding up etc. Get changed promptly and keep your belongings arranged neatly. Bow and show respect when you leave the mat or the Dojo. I want to start Aikido - What is the minimum age? Yes. Please look at the teachers link and gallery above. Of course! Please feel free to come along on any class and watch, ask questions, or better still, have a go. If you've done a martial art before then feel free to wear your existing suit, we only ask that you use a white belt if possible, if you've never done a martial art then wear something loose fitting such as gym wear. Generally most people wear karate or judo type suits in order to practice aikido, they cost from around £15 upwards. There are a few companies who produce aikido specific dogi's and they are available from around £30 or so. please see our web shop where we receive a discount off our local retailer. A bag to keep your belongings neat while you are on the mat practicing. Don’t forget some money or a cheque book to join or pay for lessons. Ensure that you are clean and hygienic, poor personal hygiene will not be tolerated. Etiquette, if you're unsure of something then please ask or follow the other students. · When entering or leaving the dojo, it is proper etiquette to bow in the direction of O Sensei's picture. · You should also bow when entering or leaving the mat. · If you arrive late for a class then simply sit on the edge of the mat until the teacher is aware you're there. · If you need to leave the lesson for any reason then please let the teacher know. · Remove watches, rings and other jewellery before practice as they may catch your hair, skin, or clothing and cause injury to yourself or your partner. · Please keep your fingernails (and especially your toenails) clean and cut short. · Keep your training uniform clean, pressed, in good condition and free from offensive odours. · Please keep talking during class to a minimum. What conversation there is should be restricted to Aikido. It is impolite to talk whilst the instructor is addressing the class. · It is usually considered polite to sit in seiza (knelt down) and to bow upon receiving assistance or correction from the teacher. 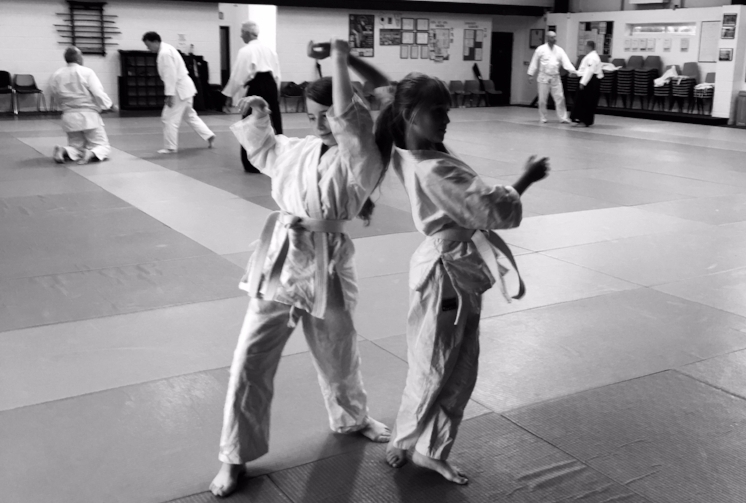 · Whoever is teaching is referred to as sensei only whilst they're teaching, if you are speaking to a Japanese teacher on or off the mat that you should always use the term sensei when addressing them. Example: Do I require previous experience? Leisure at Cheltenham, Tommy Taylors Lane, Cheltenham GL50 4RN.